St. Benedict founded the Benedictine order and drew up the rules that became the basis for life in monasteries throughout Europe. Legends about him tell of his struggles with temptation and the miracles he performed. Born into a wealthy family around A . D . 480, Benedict went to Rome to study. In time he became disgusted by the lack of morality in Rome and decided to live as a hermit in a cave some distance from the city. Benedict soon became famous in the area, and a local monastery asked him to become its abbot. However, the monks objected to the new abbot's strict rules of behavior and tried to poison him. Although Benedict returned to his cave, followers kept flocking to him. Eventually, he established 12 monasteries, each with 12 monks, and assumed control of all of them. In about 525, Benedict founded the famous monastery of Monte Cassino. It was there that he wrote the Benedictine rule that set the standards for monastic life in western Europe. Because of his influence in spreading Christianity through the monastic movement, Pope Paul VI named Benedict the patron saint of all Europe in 1964. St. Benedict is best known for establishing the Benedictine Rule, a code of monastic living that is still followed. 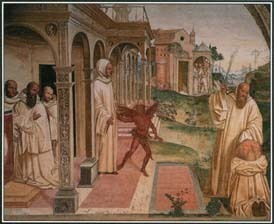 In this Italian painting of the 1500s, St. Benedict whips a man to drive out the demon that has possessed him. when his ax broke. The head flew off the handle and landed in a lake. According to the legend, Benedict went to the water's edge and held the handle in the water. The ax head came out of the water and fitted itself back on the handle.